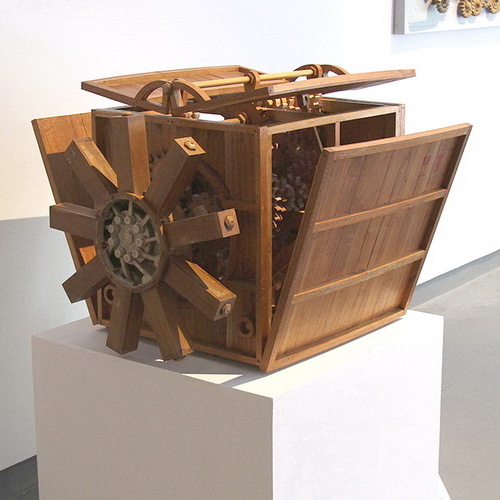 Tinuku ~ Rudi Hendriatno presenting works of sculpture in the form of a wooden machine during an exhibition at Edwin's Gallery, Jakarta, February 6 to February 19, 2017. The group exhibition entitled Contemporary Art and Social Turbulence featuring 16 artists in works of sculpture and installation. 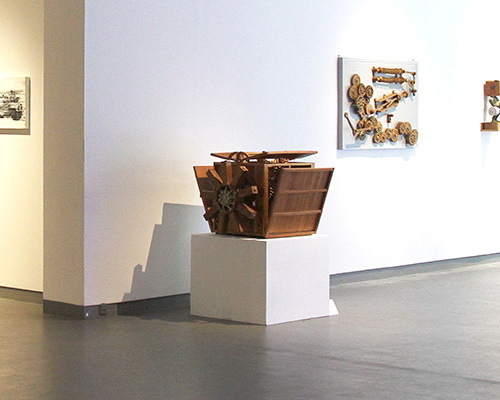 Rudi Hendriatno displaying works of sculpture in the form of machines using wood material titled "Wood Engine - Packing" as a work of kinetic art at Edwin's Gallery. An object is dark brown wood and has a box-shaped components are assembled into a machine completely. 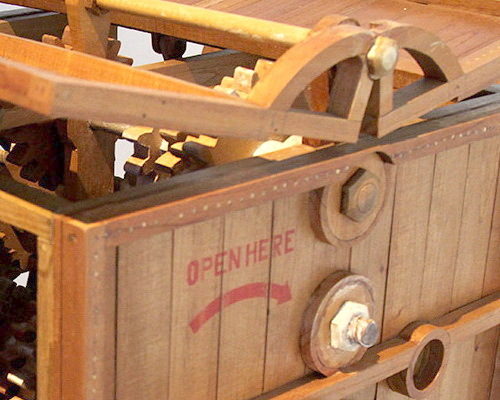 The top side has a door that can be opened to reach the inside of the machine, but the two doors leading to the top with a hinge in the middle. Parts of the left and right have also opened the door and upwards. The other side of a component in the form of a propeller looks like a radiator in a car engine. Herdianto more as a sculptor creating works of objects machine using wood materials. 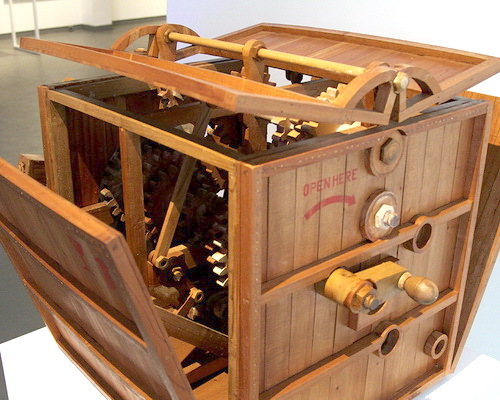 Artists as if responding to the world in the development of human interaction with the machine through ironic way, although the wooden machine can be driven in the law of kinetic motion. "Turbulence is the irregular movement due to differences in air pressure or temperature. Mechanical wind turbulence due to friction with the buildings or mountains, and more. Turbulence caused by the movement of air maneuvers, "said Effendy Rifky, curator of the exhibition. "Turbulence in this exhibition represent the rise and fall of cultural, socio-political, economic and religious communities, influence and connection to the world of artistic and production idea of art forms," said Effendy. The exhibition also displays works by Abdi Setiawan, Adi Gunawan, Arya Pandjalu, Ayu Arista Murti, Dedy Shofianto, Francy Vidriani, Kara Andarini, Muhammad Vilhamy, Mujahideen Nurrahman, Rega Ayundya daughter, Rudi Hendriatno, Rudy Atjeh, Septian Harriyoga, Tara Astari Kasenda, Yogie AG, and Yosefa Aulia.